HUBBARD Rose Marie Cashier, 92, died on Tuesday morning, September 04, 2018, peacefully at home with her family at her side. She will be sadly missed by all who knew and loved her. 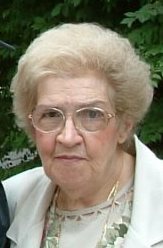 Mrs. Cashier was born Oct 25, 1925 as Rose Marie Angelo in Youngstown, OH, daughter of Frank and Mary (DiCristofaro) Angelo. She was a lifelong resident of Hubbard, Ohio and member of St. Patrick Roman Catholic Church. Rose graduated from Hubbard High School in 1944 and married Nicholas J. Cashier Sr. on June 24, 1950 at St. Patrick Roman Catholic Church. Between raising two sons, she worked at Dillard’s (formerly McKelvey’s) department store in Youngstown, Ohio for almost 40 years before retiring in 1982. Rose was preceded in death by her husband of fifty-seven years, Nicholas Sr., and four brothers, Edward (Larry), Guy, Walter, and Tom; and three sisters Edith (Affinito), Vi (Burns), and Eleanor (Ohle). She is survived by her two sons, Robert (Mary Ann Szelest) Cashier of Liberty, OH; Nicholas (Frances Beale) Cashier Jr. of Russell, OH; three grandchildren, Rebecca (Chad) Boger of Lakewood, CA, Graham and Sydney Cashier of Russell, OH; three great-grandchildren, Stella, Oliver, and Theodore Boger of Lakewood, CA. Family and friends may call between 9:30 – 11:00 AM on Saturday September 8, 2018 at Kelley Robb-Cummins Funeral Home, 709 North Main Street, Hubbard, OH 44425; followed by a funeral mass at St. Patrick Roman Catholic Church, 225 North Main Street, Hubbard, OH 44425 at 11:30 AM. Interment will be at Hubbard Union Cemetery, 210 Oakdale Ave SE, Hubbard, OH 44425. In lieu of flowers, please send donations to St. Patrick Roman Catholic Church, 225 North Main Street, Hubbard, OH 44425.